Editors Note: There is one photo and one video associated with this release. The HTML500, Canada's largest learn to code event, was created by Lighthouse Labs with job seekers and career changers in mind. 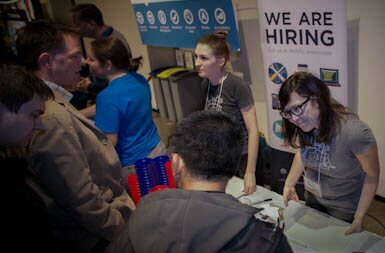 After creating their own landing page through an easy, hands-on HTML and CSS curriculum, participants can immediately apply for jobs and explore career opportunities at The HTML500's on-site career fair presented by founding partner, Vancouver Economic Commission. The career fair is a new feature to The HTML500 experience, boosting networking opportunities between participants and recruiters. "Basic programming knowledge is quickly becoming a prerequisite to entering the job market as more companies across all sectors embrace technology. We strongly encourage participants to bring their resumés so they can apply for the technical and non-technical jobs available at the career fair," says Jeremy Shaki, Lighthouse Labs co-founder. Across Canada, the need for digital literacy increases as the technology sector grows. In B.C. alone, there are 84,000 technology jobs and the sector pays 66 per cent higher wages than the industrial average, according to the most recent British Columbia Technology Report Card. "At the end of the training day, 500 British Columbians will have new and improved digital literacy skills they can start using right away," says Amrik Virk, Minister of Technology, Innovation and Citizens' Services. "This is a fantastic event that boosts our skilled workforce, creates job opportunities for individuals and helps meet the growing needs of B.C. employers," continues Virk, who speaks on behalf of The HTML500's founding partner BC Innovation Council. The HTML500's learn-by-doing approach mirrors Lighthouse Labs 8-week coding bootcamp. Participants are expected to bring their own laptop to the event. Internet connection and lunch will be provided. "Vancouver continues to rise as a global tech hub, boasting homegrown, internationally-recognized start-ups," said Ian McKay, CEO of the Vancouver Economic Commission. "Our support of the career fair will help our partners in the technology sector, and the many other sectors that rely on technology today, meet their need for highly-skilled people. It will also showcase Vancouver, a city that is innovative, creative and sustainable, with world-class livability and solid business support networks." The HTML500's 2015 National Founding Partner, TELUS, will also be participating at the career fair. "We're looking forward to joining attendees at The HTML500 event, sharing our expertise and meeting participants at our career booth," said Shawn Mandel, Vice-President at TELUS digital. "We're always looking for talented individuals to join our team who have a passion for the web and all things digital and can thrive in a collaborative, customer-focused and fast-paced environment." Check out TELUS digital's latest job postings at labs.telus.com/blog/careers. TELUS (TSX:T) (NYSE:TU) is Canada's fastest-growing national telecommunications company, with $11.8 billion of annual revenue and 13.5 million customer connections, including 8.0 million wireless subscribers, 3.2 million wireline network access lines, 1.45 million Internet subscribers and 888,000 TELUS TV customers. TELUS provides a wide range of communications products and services, including wireless, data, Internet protocol (IP), voice, television, entertainment and video, and is Canada's largest healthcare IT provider. To learn more about TELUS visit www.telus.com. Lighthouse Labs is providing free coding education through The HTML500 in the spirit of championing digital literacy across Canada. Following hands-on training in basic HTML and CSS, participants can visit the career fair, where they can apply for technical and non-technical positions available. Find out more about The HTML500 and career opportunities by watching this video.